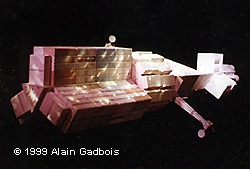 Alain Gadbois' scrachbuilt freighter . The Cassiopeia is one of the many nuclear-powered space cargoes used by Intercorps to ship finished goods and equipment to colonies in the Solar System. The 1/100 scale ship was designed and built as a 3rd year project for the School of Design at the University of Montreal. The vessel was realized by a team of three students, Alain Gadbois, Vincent Bedard and Daniel Lacroix, over a period of two months. The project's main goal was to design a believable vessel while applying techniques learned at the school. To this end, a number of elements were set down from the beginning to guide the overall look of the space ship. Cargo Pods: all cargo pods are standardized. They are space-worthy and can be ferried to and from orbit by an hypothetical second-generation space shuttle. Structure: the core of the ship is a simple triangular truss. Additional truss elements can be added to the design to lengthen the vessel if required. All ship systems are attached to the truss: propulsion, reaction mass tanks, maneuver engine clusters, etc. The crew modules, communication/sensor towers and auxiliary craft hangars are placed in the center of the ship. Propulsion: When the ship was designed (1984), the only reasonable means to propel such a vessel was nuclear. The crew section is thus placed well in front of the engines, with the reaction mass tanks placed in between to serve as additional shielding. 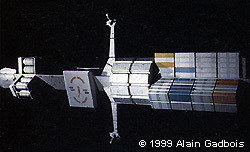 One must note, however, that the modular design of this freighter can easily accommodate a variety of propulsion devices, such as ion or pulsed explosion engines. Crew: despite the use of nuclear propulsion, each voyage will last several months. The crew is thus housed in two contra-rotating (to neutralize any coupling effect) modules placed amidships. The cylindrical modules are composed of several partitioned housings, some of which house a self-sustaining ecosystem. A series of hydraulic devices can modify the orientation of the housings to maintain a constant gravity, regardless of acceleration. A rather large scale (1/100) was selected to create an impressive and detailed model. The resulting ship is almost exactly seven feet long. Since the model would be moved and handled a lot, a solid structure would be required. The core of the ship is a hardwood truss made of two half-inch thick planks glued and screwed in a "T" shape. All further elements are attached to this core, which is extremely rigid. 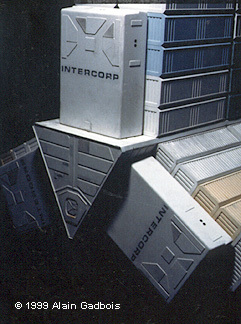 The cargo sections was made up of large "monobloc" ten-container units, each one made out of thick styrene sheets. The latter were grooved with a handsaw prior to assembly. Thin styrene strips were added for detail, then each container was painted and weathered to give the impression of individuality. Care was taken to ensure that the level of weathering was varied, as if each container was of different age and provenance. The ship features only four rows of containers, but the original design called for nearly twenty of them. The maneuver engine clusters (the large white boxes marked "Intercorps" at the front of the ship) were commercially-bought plastic dishes which were then detailed with strips of styrene. The communication and sensor masts were fashioned entirely out of styrene sheets except the ends, which are adapted fuselages from two Revell 1/32 scale Cobra helicopters. The main engine bells were vacuformed over a turned wood master. Several attempts were needed to ensure that the large pieces came out correctly. A similar method was used to create the numerous two-piece reaction mass tanks. Once these were complete, the engine section was created out of thick styrene sheets and strips (the latter to build the "cage" that would hold the tanks). 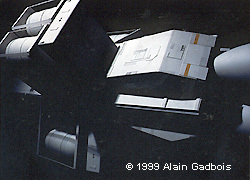 The main auxiliary craft bay was shown open to space, so a few work pods were created out of sheet styrene. The large cockpit on each pod is a disposable plastic spoon cut to size and painted semi-gloss black. 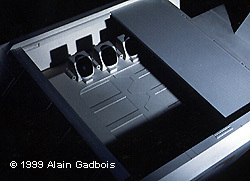 Styrene strips and rods was used to detail the surface of each pod. One of the pods is equipped with an additional connector which locks into a "H" bar that allows it to grab and move whole containers. This piece is very simple and made of styrene strips. 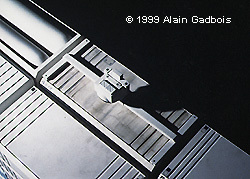 Once assembly was complete, the entire vessel was given a base coat of matte white enamel from a spraycan. After leaving it to dry for several days, further details were airbrushed in. 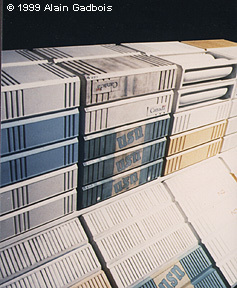 The markings were taken from a large variety of commercially-available dry transfer sheets. After the basic painting was complete, the ship was weathered with pastel, both wet and dry. Application was mostly with a soft brush, with a number of sponges and absorbent sheets used to remove the excess as needed. The model received an excellent grade from the teacher and was subsequently exposed in a local museum for a time. It was modified so that it could be broken down into separate sections for transport and storage; the main truss was sawed and a steel beam was inserted between the two resulting halves to reduce the maximum length to something more manageable. The modular construction proved very helpful to move it -- just the core section (habitats plus containers) requires two persons to lift! The ship is currently stored in the Fusion Models workshop. This page copyright © 1997-9 Starship Modeler. Last updated on 18 November 1999.